Hydroponics has a host of clear-cut advantages in today's world. You can grow plants anywhere, all through the year, and get healthy, clean, and organic produce right inside your home. But hydroponics has one significant disadvantage: it takes quite a bit of technical knowledge and investment in the beginning. The learning curve is a bit steep, and the complexity can be daunting. There are many different methods and techniques to choose from, like aeroponics, aquaponics, drip irrigation, NFT, ebb and flow, and deep water culture. This is where wicking systems are so useful. If you are a beginner, this is pretty much always the recommended system for your first grow experience. Besides the Kratky method, the wick systems are the simplest form of hydroponics and the least expensive as well. It also works well with less demanding plants like herbs or lettuce. There are traditionally six different types of hydroponic systems for growing plants indoors without using soil. Of these six, a wick system is the simplest. All hydroponic systems are classified into two basic categories: active and passive. The wicking system belongs to the passive group. This means that such a wick system has few moving parts. It does not require sophisticated machinery or equipment like motors and pumps, or feats of extreme planning and engineering. So in comparison to active systems like ebb and flow or drip system, a wick system is positively bare bones and rudimentary. This system gives beginners a quick taste of hydroponics. You may even have encountered this system in school, as it is often used by teachers to explain the capillary action or as an introduction to hydroponics. Wick system works phenomenally well with low maintenance plants that require less water and nutrients. Herbs like rosemary, and leafy vegetables like lettuce are excellent options for a wick system. The working principle behind the wick system is based on capillary action. This is a natural, everyday phenomenon related to the movement of water across closed tubes. Water getting absorbed by paper towels is a result of capillary action. The process of wicking, whereby certain fabrics take away sweat from our skin is another example. On a very related note, plants absorb nutrition and water from the soil, through the root and up their stems using this same action. Capillary action occurs because water drops are by nature very sticky. When it gets inside a thin tube or very porous materials, it sticks to the walls. This sticking action creates a curved surface, called a meniscus, at the top edge of the water droplet/molecule. A water drop is held together by the internal bond between its molecules, which creates surface tension. When the adhesive force between the water droplet and the capillary walls is stronger than the surface tension, the water keeps moving upwards. Gravity and the thickness of the tubes/porosity of the material will decide for how long capillary action can continue. 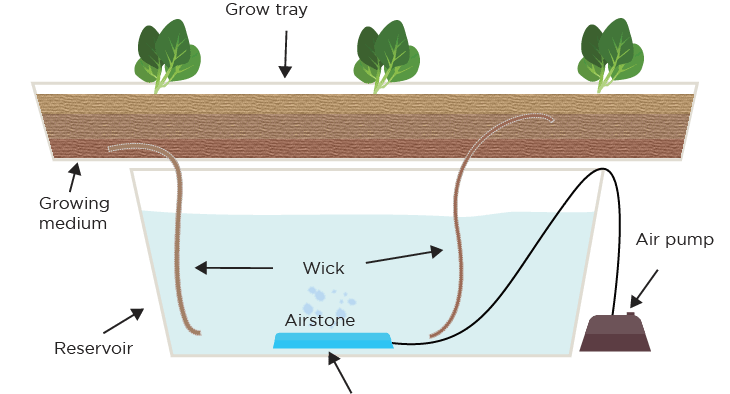 In hydroponics, a wick system exploits this capillary action of water to draw up water and nutrients from a reservoir to the plants. Since we are talking about hydroponics, plants will be some sort of grow medium, not soil. Each plant will have at least one wick, preferably two, connecting it to the reservoir. The latter is usually placed immediately below the growing surface or tray for maximum effectiveness. Due to capillary action, the water and dissolved nutrients will travel from the reservoir up to the plants through the wicks. That is all there is to a wicking hydroponic system. To build this system, fill the reservoir with the mix of water and nutrients. Place one of the wicks in the growing media. Place the pot or tray containing the plant in such a way that the wicks are hanging from the tray or pot into the reservoir. You will need some trial and error to figure out the details like optimum length of the wick, the maximum height at which the plant can be kept, and so on and so forth. And that is all there is to it. Building or maintaining a working wick system is not rocket science. All you need to do to taste success in your first stab at hydroponics is to take the following precautions. In wick system, two components do most of the heavy lifting. These are the wicks and the growing medium. 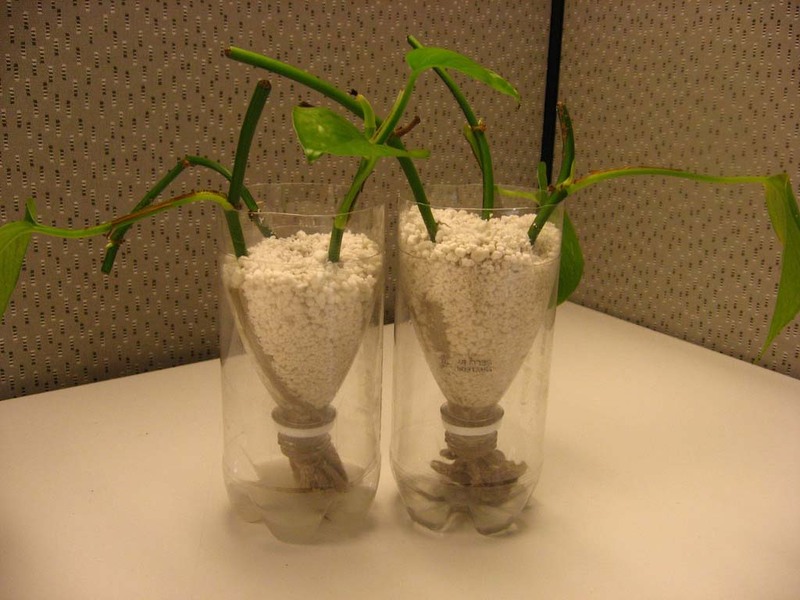 Any common household material can be repurposed as a wick for an entry-level hydroponic system. You don't need to seek out any advanced materials in shops or anything. For instance, pieces of fabric used in winter clothes tend to have excellent wicking properties. These can be torn into long strips. Many artificial fibers used in ropes and strings, like nylon or polyethylene will do the trick. Synthetic fibers also tend to be more durable than natural fibers like cotton. The two desirable properties on an excellent wick are a high rate of absorption and resistance to rotting. If you want, you can test the wicking ability to different fibers to arrive at the best possible option. Use a sample of colored water to measure how high the water can travel in one hour in each fabric/material. The shorter the length of the wick, the easier and faster the water will travel from the reservoir to the plants. So it is best to keep the plant right above the reservoir in a wick system. The number of wicks required is tied to the plant species and its water requirements. Generally, it is considered best to have at least two wicks per plant for optimal hydration. Compared to other active hydroponic systems, the movement of water in a wick system will be slow, and of less quantity. So you want the growing medium to be highly efficient at absorbing and retaining water. Some popular choices include coconut coir, perlite, and vermiculite. Other soilless mixes are also good options as they usually have excellent water retention abilities. In a single plant system, you can use any pot or tray to house the growing medium. But if you plan to grow several plants, growing them together in a single large tray is often the best solution. In such a system, the entire tray will be filled with the growing medium. Regardless of your choice, remember to flush your growing medium with fresh water every few weeks. This will help remove any build up of excess nutrients. This is the other component that requires periodic maintenance and refills. Since the efficiency of the wick system depends on the distance that water has to travel up the wick, it is best to top up the reservoir regularly. Having an aeration system is a good choice in an advanced wick system reservoir. This ensures that the water is adequately oxygenated. This is important as the roots of the plants are never dry in a wick system. You can use a regular aquarium air stone and pump as your aeration system. The water inside the reservoir will need to be often refreshed to maintain the optimum nutrient balance. If the reservoir is not in a light-free area, this will also help prevent the growth of algae and other organisms in the nutrient-rich water. This section is pretty straightforward. Small herbs and non-fruit vegetables like lettuce are all you can hope to grow with a wick system. It is not very efficient at delivering large quantities of water and nutrients. Veggies and fruits like tomatoes need a lot of water and nutrients. Light feeders like lettuce can thrive in a wick system. Larger plants will probably starve to death in this system. 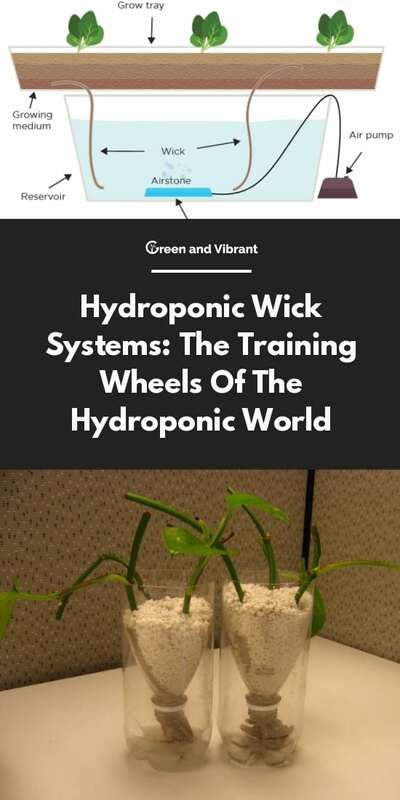 A wick system serves a very specific purpose in the world of hydroponics. It is the best primer for beginners in this complex field. But pretty soon, you will have outgrown this system and moved on to bigger and more powerful systems. You can consider this system like the training wheels on a bike. But within its limitations, the system is highly effective. Even after you have upgraded to more sophisticated systems, you can still use a wicking setup for some fresh herbs in your kitchen!